“Bodhichitta is the foundation not only of Dzogchen, but of all Dharma practice. Bodhichitta has two aspects: (1) wishing or aspirational bodhichitta, and (2) actualizing bodhichitta. Wishing bodhichitta does not mean only reciting the words of a bodhichitta prayer; it means to keep generating genuine care and concern for all beings from your heart. Continually cultivate the four boundless thoughts: boundless love, boundless compassion, boundless joy, and boundless equanimity. Pray that all beings will enjoy long life, health, prosperity, and the fulfillment of all their wishes that are in accord with Dharma. Pray that they attain complete enlightenment. At the same time, pray that your desire and ability to help all beings keeps growing. This is wishing bodhichitta. Actualizing bodhichitta means to help others according to your abilities and their needs—it is putting wishing bodhichitta into action in words and deeds. Bodhichitta is the way of the great Dzogchen masters. For example, Patrul Rinpoche always contemplated and practiced the four boundless thoughts and spent his entire life helping others. When we read the life story of the great master Jigme Lingpa, we see numerous examples of the greatness of his love and compassion—the degree and strength of his bodhichitta was enormous. The biography of Jigme Lingpa tells that earlier in his life, when he was practicing in a hermitage, he was very poor, but whenever he saw suffering people, such as beggars, he gave them the clothes off his back. He did not have much to eat—maybe one bowl of soup—but would give whatever he had to the hungry. Patrul Rinpoche and Jigme Lingpa are role models and examples. This is true also of the great Dzogchen master Longchenpa. And not only these three, but in fact all the great Dzogchen masters throughout history were also great practitioners of bodhichitta. They practiced the teachings they were given, realized those teachings, and shared the fruits of their realization with others. This was also the way of Buddha Shakyamuni. We are following in the footsteps of these great masters. This means we should cultivate and manifest bodhichitta in our hearts and minds, in our words and in our actions. We should strive to increase, deepen, and expand our capacity to help others. This is the foundation of our Dzogchen practice. 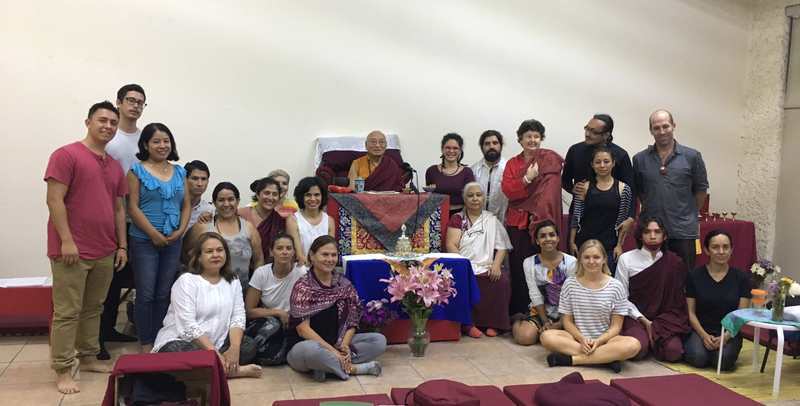 Photo of Venerable Khenpo Rinpoche with the Yeshe Nyingpo Sangha in Ensenada, Mexico on September 12, 2017.